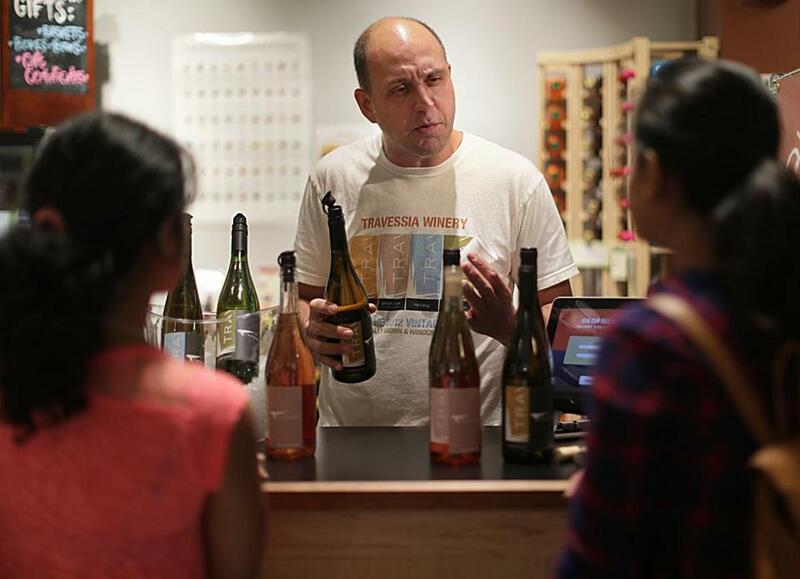 Marco Montez of Travessia Urban Winery offers samples of his wine at the Massachusetts Wine Shop. The Boston Public Market has a best-kept secret, and it’s all about drinking local. If you’re curious about exploring Massachusetts wines year-round, there’s no better place in the city to do it. Tucked between a purveyor of smoked fish and a vendor of specialty nuts is the Massachusetts Wine Shop. The compact retail space features 80 wines (including a few ciders and mead) all crafted in the Bay State. Organized by Massachusetts Farm Wineries & Growers Association, it offers the largest selection of its kind anywhere in the region. “It’s the first of its kind, concentrating just on viticulture and winemaking here in Massachusetts,” says manager Alan Howarth. The idea, he says, is to put the wares of small, family-run vintners in front of local and visiting enthusiasts. Howarth estimates that a quarter of the shop’s pours are made from cold-hardy hybrids while the rest of the grape-based wines are crafted from Vitis vinifera, from which most of the world’s wine is made. Here, a shopper will find everything from a $10 bottle of hard cider to a $46 sparkler made in the traditional Champagne method. The retail space builds on momentum created by 2010 legislation that allows Massachusetts farm-wineries to sell their bottles at farmers’ markets. That change in the law has helped raise the visibility of the state’s wine industry among consumers. The shop seems like a natural extension of those efforts, so it’s surprising to realize that nothing like this existed prior to last year. When the Boston Public Market opened last summer, the MFWGA had yet to receive its retail license, so the 20 or so members who had pooled funds to launch the shop had to wait. By the time the shop was up and running, the sleek indoor market, 40 vendors strong, was well into a groove. Fortunately, word started getting out as downtown residents discovered they could pick up a bottle along with their groceries for dinner. They like being able to try before they buy (there are daily tastings) and to learn about what’s in their glass. Massachusetts Wine Shop at the Boston Public Market, 100 Hanover St., Boston, 617-973-4909, www.bostonpublicmarket.org.